In a recent morning meditation, while striving to empty my mind, two mysterious ones appeared with a message that they were available as guides for this next Full Moon. Kwan Yin and Frigga—not often seen in each other’s company I admit—offered their guidance at finding balance at this Full Moon in Pisces (September 9). Every Full Moon is a balancing time when the Sun and Moon exactly oppose each other. Opposite signs are complementary, showing diametrically different ways of doing things that are also perfect mirrors for each other. So many illuminating lessons come from these oppositions. I’m relieved to have these beings as models for this one. I believe Frigga showed up because she really gets the Virgo mission (the Sun’s sign) to create order in the household. Frigga is the Norse goddess of home maintenance. I describe her that way with the utmost respect for her significance and power. A well-run home is a essential asset but its value is often overlooked. That is one of the problems Virgo faces too, a belittling of the importance of day-to-day practices that create wholeness in our lives. The Virgo lunar cycle gives us an opportunity to claim this power. Frigga shows us how by her steady influence. Kwan Yin is the all-compassionate being (of varied gender expression) from Buddhism who opens the door of Piscean consciousness. My favorite images of Kwan Yin show them standing on a dragon. In fact, I’d say it looks more like surfing than standing. This Bodhisattva exemplifies fierce compassion, riding the dragons of illusion and pain without abandoning their vow to continue hearing the cries of the world until all beings are liberated. Pisces, too, likes to think it is big enough to sacrifice everything in the service of liberation. As mere humans, we often need help with such an enormous calling. This is where I think Frigga and Kwan Yin together can help. In this lunar cycle, I am seeking to achieve balance between everyday acts of wellbeing and a heart that is learning to ride the dragon of compassion. The more I open to hearing the cries of the world as Kwan Yin/Pisces promises, the more I need the ordered wellbeing that Frigga/Virgo offers. In farmer’s almanacs, Virgo is described as a sterile sign, not good for planting. Symbolically, I think this indicates how Virgo order without Pisces compassion can becomes rote and lacking in potency. The water of Pisces releases the fertility that earthy Virgo inherently possesses. These two signs, which can get lost in perfectionism and illusion, create a powerful anchor to health and heart when they work together. My New Moon* intention was a dedication to daily wellbeing, balance, and joy. As I look forward to the illumination of the Pisces Full Moon, may this intention be nourished by fusion of these two beings. Sunday, September 7. The day could start out with lingering irritations. The Moon squares Mars around noon (CDT) then goes into void-of-course limbo land until it enters Pisces in the early evening. We could be feeling touchy and vulnerable for what seems like no good reason. I believe the root of compassion for others starts with compassion for ourselves. This vulnerability is a good starting place for that practice. To add to the sensitivity, the Sun in Virgo opposes Chiron in Pisces. Notice how you may want to tidy up your big feelings and seek a balance between order and open-heartedness. Tomorrow’s Full Moon will further illuminate the need for this kind of balance. September 8—Full Moon: Illuminating. This is the last “super Moon” of 2014. A super Moon is when a New or Full Moon occurs at the point when the Moon’s orbit is nearest the Earth. Visually, the Full Moon will appear slightly bigger than usual, especially if you happen to see it rising. Energetically, a super Moon feels larger too. The axis of this Full Moon—Virgo Sun to Pisces Moon—stretches us from the grounded pragmatism of Virgo to the expansive connectivity of Pisces. In yoga practice, I’ve learned that the more I direct my weight into the earth, the greater I am able to move my spine and chest up and out from that downward direction. Feel into that sensation. This is what the integration of Virgo and Pisces offers. In the introduction to this week’s forecast, I wrote about Frigga and Kwan Yin, two mysterious ones who exemplify the continuum between Virgo and Pisces. The blend of these two becomes pragmatic mysticism, a quality we could really use right now to address the challenges we face. Every sign needs its opposite for balance and wholeness. This pair of signs just may benefit the most from this complementary relationship. What does it offer you? 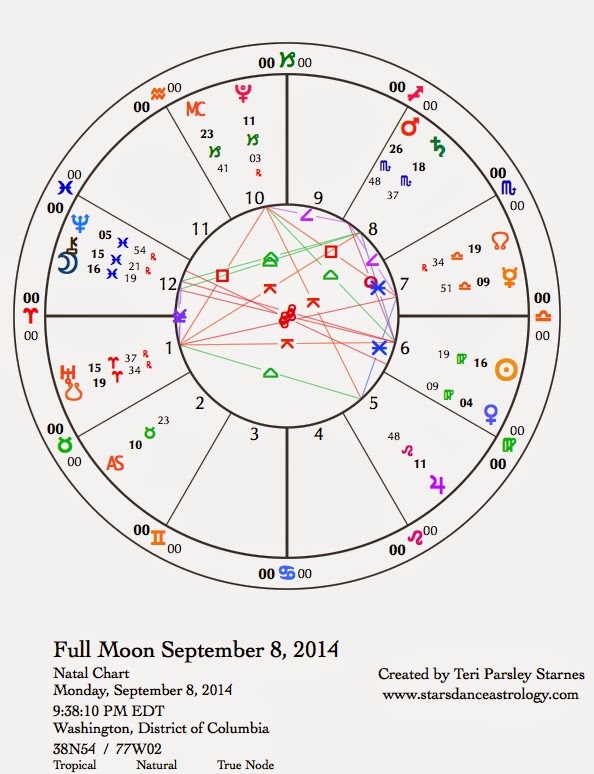 In the chart for the Full Moon tensions arise due to paradoxical desires. Several quincunx (strange and puzzling) aspects need to be integrated. The Sun in Virgo is quincunx Uranus in Aries. Is it possible we’ve been missing a piece of the puzzle that could help us bring about the swift changes we know we need? The Sun encourages us to find that missing piece. Rather than stress about it, try to enjoy the process of discovery through trial and error, small step by small step. Saturn in Scorpio is also quincunx to Uranus (with the Sun these planets form a Yod pattern). This paradox involves combining realism with revolution. The more we purge, release, and let go, the better we are able to manifest a new reality. The final quincunx is between Jupiter in Leo and Pluto in Capricorn. Setbacks can seem insurmountable. The danger is in thinking we just can’t win. Perhaps the lesson is to do our best with what we have and trust that the future will reveal new possibilities. Remember the small steps. Another moment of faith: Venus in Virgo opposes Neptune in Pisces. Simplicity, order, elegant processes all create a sense of capacity for compassion and connection, however remember to check your gut before going all in. Under this aspect things can seem better than they really are. Tuesday, September 9. The mood shifts from expansive and dreamy to focused and alert during the course of the day. Part of the focus is on speaking up about injustice. Mercury in fair-minded Libra squares Pluto. We want to expose secrets or ways power is being misused. When the Moon enters Aries in the early evening (CDT) we may even want to fight about it. Notice what comes out into the light of day. Stand up for what you believe in. Wednesday, September 10. Many of us will awaken from seductive dreams inspired by Venus’ opposition to Neptune to a fast-paced day of quick thinking and quick judgments. Mercury in Libra is concerned with harmonious expression of ideas. It is an excellent signature for a diplomat. We may need all our diplomatic skills over the next few days because this Mercury is also actively encouraging us to express our frustrations about injustice. The Moon in Aries is provocative. Mercury in Libra may want to hold off on saying the first thing that comes to mind, but the Moon is making that more difficult. What do you need to say? Are you hearing what you need to hear? Fearless communication is called for and supported by a favorable aspect from Jupiter to both Mercury and the Moon. Tensions don’t let up until after the Moon contacts Uranus this evening. Tomorrow’s work may be to clear up misunderstandings. Thursday, September 11. This is a good day to remember the gift of Virgo: the pleasure of good systems that support our wellbeing. What will help you detox from the stress of the last few days? The Sun in Virgo makes a favorable contact with Saturn in Scorpio. These practices of detoxification will help us move forward. Pay attention and make a plan. We get great support from Saturn to follow through with our intentions. September 12—Disseminating Moon: Sharing. The Virgo season is harvest season. All mutable signs, of which Virgo is one, are concerned with integration. We can think of the harvest, too, as integration, a reaping of the growing season. Choices have been made, seeds planted, the weather was the weather, and now we see what has come of it all. It is time to take it in and assess the value. This phase of the Moon marks the time to assess and share what has come of our Virgo intentions planted at the New Moon. We are in the mood to look at the value of this lunar cycle materially. The Moon in Taurus makes favorable aspects with other earth energy: Venus in Virgo and Pluto in Capricorn. What benefit have you garnered in a real physical sense from the lunar cycle so far? Have you organized a part of your life in preparation for the fall ahead? Have you made more room in your physical environment by purging or releasing? Have you committed to a practice of wellness? Have you made pragmatic choices? Where have you landed at this stage of the cycle? What have you learned? What are you reaping? Saturday, September 13. Since Mercury opposed Uranus in the middle of the night (CDT) we may not have had the most restful sleep and could wake with a need to question the status quo. This is a great aspect for innovation and dismantling of outdated concepts. The influence of the Moon in Taurus is to demand proof before we go along with anyone else’s sudden insights. This skepticism is an interesting atmosphere for Mars’ entry into Sagittarius today. We are emerging from a series of challenges to expression of will and passion. Mars took a long journey through Libra where we had to learn the skill of deferring to others. Then Mars entered Scorpio and stirred up some of the hidden resentments we may have acquired during the Libra transit. Now, in a fire sign, Mars really gets going. This means less hesitation and more forward momentum, ready or not. Hopefully, we’ve learned how to value moderation during this Virgo lunar cycle. It will come in handy.